Home » journey-travel , local , travel » Art Attack!! 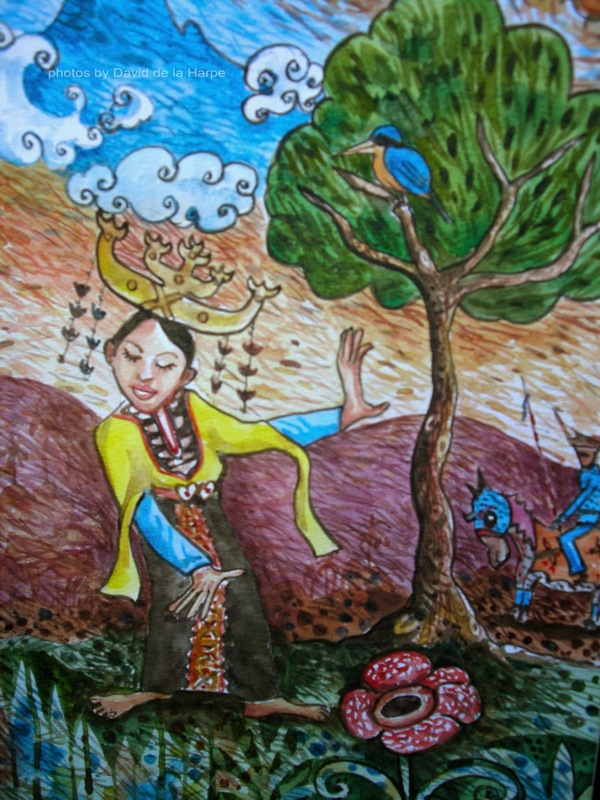 A bojau lady dancing by Daiman Bona. art classes organised by the Sabah Arts gallery. The painting styles that dominate amongst the local artist can be considered contemporary with a strong emphasis on ethnic traditions and designs and of course our unique nature. It is very common to find such icons like Mt. Kinabalu, Orang Utans, Rafflesia flowers, endemic orchids and pitcher plants as subjects in the paintings. Many of the artists also dabble in the “Naïve art” style. For locals and visitors to the state, this is a perfect way to bring something ‘Sabahan’ into your home and at the same time contribute to the growing appreciation of local artist and their work. Azlan Dulikab resident artist at the house of Myuri. booth at the Gaya Street Sunday market. Calling themselves the “Kinabalu Artist”, they display their paintings and sketches on a little side stall. As the Gaya street market is very popular with tourist, the artists tend to display smaller pieces and subjects that will suite the average taste and luggage restrictions of tourist. The favourites subjects painted are Orang Utans, scenes of local village life, Mt. Kinabalu and nature. Most of these are watercolours with the odd acrylic painting. A trio of Artist at Gaya street. that has a couple of resident artist who paint here runs one of the galleries. The other artist who has set up his gallery here is Patrick Monjong . Patrick is also a self-taught artist who started out doodling cartoons. He understudied with Benedict Cheong a well known local artist who’s speciality is Batik panting before branching out on his own . Patrick is very fond of the underwater world and its marine life. Most of his paintings incorporate some species of marine life from fish to seahorses. He has added a whimsical angle by painting the local Bajau Horsemen riding on seahorses under the sea. 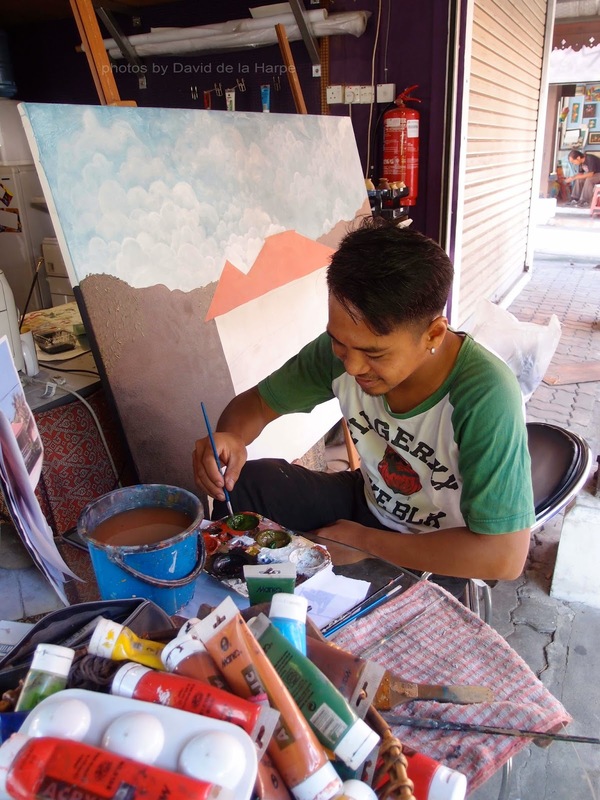 So if your in the market for a painting on Sabah, do stop by at the stalls at Leman Seni or Gaya street and take the opportunity to talk to the artist themselves, its always interesting to know some of the stories behind their paintings.